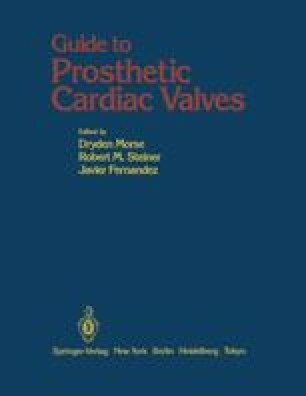 The first clinical use of a mechanical prosthetic valve was by Charles Hufnagel who, in 1952, partially corrected aortic incompetence by inserting an acrylic ball valve prosthesis into the descending aorta. A few of those prostheses functioned for up to 18 years, but it was only after Gibbon had introduced the heart-lung machine in 1953 that an open-heart operation could be performed under direct vision. The first surgery for calcific aortic stenosis in the late 1950s was then the removal of calcium from the valves. However, it was found not to be a good method, as the calcium returned within a few years, and many valves were so destroyed after decalcification that good function could never be restored. The first artificial heart valves copied our human valves and were made of Teflon, the so-called Bahnson valves. These pocket valves were encapsulated in the bloodstream by a thin sheet of fibrous tissue after deposition of platelets and fibrin, which after 1 to 2 years tended to shrink down so that the edges of the valves were turned in and the valves became insufficient, or so much calcium was deposited on the Teflon leaflets that they ruptured between 1 and 2 years.